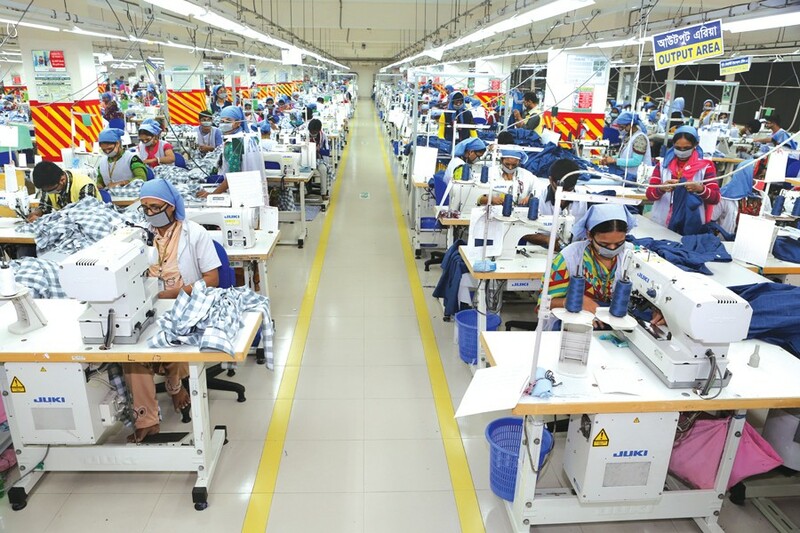 About two years ago, Bangladesh Garments Manufacturers and Exporters Association (BGMEA) had set a goal to increase annual export of readymade garments to 50 billion US dollars by 2021. There is also a roadmap drawn up by experts assigned by BGMEA to achieve the target. Although not much has been heard recently about this roadmap, the RMG export has already started facing many challenges. The challenges spelled out in the roadmap included removing infrastructural bottlenecks, boosting productivity, skills development, attracting more FDI, fast-tracking safety efforts in the factories and ensuring rights of the workers. Notwithstanding these long recognised issues, country's export growth has started slowing down in recent months together with growing pressure from the importing countries to act quickly on reforming the labour laws. Since the Rana Plaza tragedy in 2013, the global concern over the working conditions in the factories along with workers' rights has never lost its steam. The international trade unions have continued their efforts to pressurise the importing countries for substantive progress on the commitments made by Bangladesh during the launching of 'Sustainability Compact' in 2013 between Bangladesh, the USA, EU and the ILO, with inclusion of Canada in 2016. The successive reviews of Compact held in Dhaka and Geneva in last few years manifested the concerns of the partners on certain aspects of amended Labour Act of Bangladesh. The focus is mainly on trade union rights in the factories inside and outside the EPZs. Bangladesh has repeatedly been warned by the EU about the possibility of missing the duty-free access to its market unless there is substantive improvement on the issues related to workers' rights. Bangladesh has sent a draft to the ILO which contains some positive changes in the Labour Act as suggested by the ILO Expert Committee. There may be some initial feedback from ILO on that draft by the end of November 2017. However, the real test of these changes (conforming or not with ILO standards) will be known in June 2018. It is to be kept in mind that all Bangladeshi exports, not just RMG, the preferential access or duty-free entry under GSP/EBA in the EU, even as LDC, has been subject to adherence to certain UN and ILO Conventions since January 2014. Interestingly, two of these ILO Conventions (Rights of Association and Rights of Collective Bargaining) are included in the original Compact Declaration signed by Bangladesh. What happens when Bangladesh graduates from the LDC status? Graduating from LDC, though unlikely to happen before 2021, our exports to the EU will face new challenges. First, Bangladesh will lose EBA and be bracketed as a beneficiary of General GSP. Secondly, Bangladesh will miss relaxed rules of origin enjoyed so far as LDC. For RMG, it means, importers will pay most part of the standard duty when importing from Bangladesh. Again, GSP is given for RMG, only if the fabric is produced in Bangladesh. Even if Bangladesh applies for GSP+ and starts receiving duty-free access again, the rules of origin for General GSP will be applicable, unlike the relaxed rules for LDCs. To retain GSP+, Bangladesh will also be required to comply with 27 UN/ILO Conventions instead of 15 for the LDCs. Another immediate challenge the Bangladesh RMG export will face is the new GSP administration in export to the EU. Presently, Export Promotion Bureau (EPB) is the only competent authority to issue GSP certificate for RMG. From 2017 or 2020, depending on the decision of Bangladesh, all the GSP certificates for the EU will be issued by the exporters. EPB will only work as overseeing body for the registered exporters whenever verification on an export is asked by the customs authority of the importing country of the EU. The new system of GSP certification will require appropriate preparation for individual exporters as well as for BGMEA/BKMEA. This is a vital requirement as knit and woven products account for about 90 per cent of Bangladesh export to the EU. RMG sector is concerned that its competitors like India and Vietnam will benefit more from free trade agreement (FTA) with the EU. Although Trump Administration has withdrawn membership, there was apprehension that Trans-Pacific Partnership (TPP) could negatively affect export to the USA. Bangladesh does not enjoy any preferential access under GSP or any other system in the USA for apparel products. But losing out to Vietnam in respect to export to the USA and the EU under FTA is unlikely to happen in the short term. The "Yarn forward Rules of Origin" in the TPP will be a major impediment for Vietnam to enjoying duty-free access for its apparel products. It means all products in a garment from the yarn stage forward must be made in one of the countries that is party to the TPP agreement. With an inadequate backward linkage in the textile and clothing, Vietnam is also not going to adhere to the stringent rules of origin for duty-free export of textile and clothing products to the EU. Vietnam's only solace is the cumulation allowed with South Korea. As for India, the protracted FTA negotiations which started 10 years ago does not show any remarkable progress to see its application in the immediate future. Foreign Direct Investment in the RMG sector has been identified as a condition to boost export to reach the envisaged target by 2021. However, BGMEA and BKMEA have been lukewarm on encouraging FDI in the RMG. During the quota regime under WTO, Bangladesh discouraged FDI in RMG to prevent its competitors from using the quota enjoyed by Bangladesh. Now that MFA regime is over, there is still some hesitation to encourage FDI in RMG. Bangladesh RMG is overwhelmingly dependent on cotton-based items. The relaxation of EU GSP rules has not changed that scenario. Graduating from LDC status and missing the 'one-stage transformation' of RMG in the EU will result in increased dependence on inputs originating from Primary Textile Sector (PTS) from within the country. Accordingly, FDI in both textile and clothing is essential to boost export in the future. The challenges being faced by the RMG sector of Bangladesh have many dimensions ranging from infrastructural issues to impact of changes in the global trade regime for Bangladesh. There is no doubt that the most immediate challenge is to convince our global partners that there is a sincere commitment to remain engaged with them in improving the working conditions in the RMG factories in terms of occupational safety and rights of the workers. It will be prudent to remember that international trade union bodies are also signatories with the European and North American brands working in Bangladesh in the areas of their contractual obligations to improve occupational safety and workers' rights. The sooner Bangladesh takes over its exclusive responsibility in monitoring, coordinating and enforcing the 'National Tripartite Plan of Action on Fire safety and Structural Integrity in RMG', it will be easier to withstand pressure which is sometimes perceived here as unfair. This is the last piece written by Mr Zillul Hye Razi who was a former Trade Adviser for European Union (EU) Delegation to Bangladesh and a trade expert. He died on Monday evening. The FE & the Bangladesh RMG Centre deeply mourn his death.